Long Jumper Chantel Malone, capped the territory’s best showing ever at the IAAF World Championships by BVI athletes since the territory began competing in the inaugural event in 1983 in Helsinki, Finland, with a seventh place finish in her pet event. Ashley Kelly and Kyron McMaster advanced to the semifinals of their respective events, though McMaster was later disqualified. For Malone who competed in the finals on Friday after advancing on Wednesday, it was a season that on reflection of what she had been able to achieve, led to tears after her performance. Her year began by equaling her outdoor best of 6.69m (21 feet 11½ inches) during the indoor season. In late April, she fractured her foot and she spent May and June running in a pool, instead of putting the time into her pet event. She then she faced uncertainty if she would even be in London, for the 16th edition of the World Championships. Within the whole process, she had joined a new program in Bradenton, Florida at the IMG Academy. 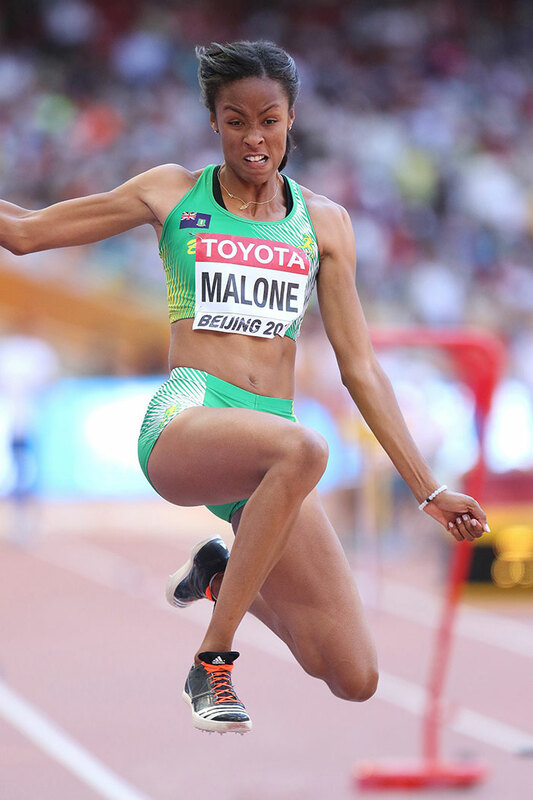 When she finished the competition in London, Malone, 25, cried on reflection, after placing seventh in the Long Jump finals with a leap of 6.57m (21 feet 6¾” inches) on her third attempt, after being temporarily in sixth place. The Long Jump specialist who also runs the 400m and contributes a leg on the BVI Women’s 4x100m relay, said becoming the BVI’s first finalist, is a major accomplishment. She said she wanted more but has to be thankful and grateful. The Long Jump specialist promised that there’s more to come. Kelly was a 400m semifinal automatic qualifier, after running 52.70 seconds. She did not advance to the final after running 54.50. Kelly, who became just the second BVI athlete to reach the semis of an IAAF World Sr. Championships event, joining Tahesia Harrigan-Scott, said becoming a semifinalist has shown her that she’s maturing and growing in the discipline. McMaster, who went into the championships with the fastest time in the world this season, was disqualified for running on the line after finishing second in his heat in 49.75 seconds. McMaster said he thought he ran a great race. The 2016 IAAF World Jr. Championships 400m bronze medalist who was debuting at the senior level, said it hit him pretty hard and he was disappointed because he went to London and was confident in what he was doing and was very focused.